Oh, that is such a good reminder that “perennial” is a flexible term; a friend in Indonesia reported that his tomatoes were perennials! As for the snakes, well, I’ve taken to rustling as I walk to give them plenty of warning. 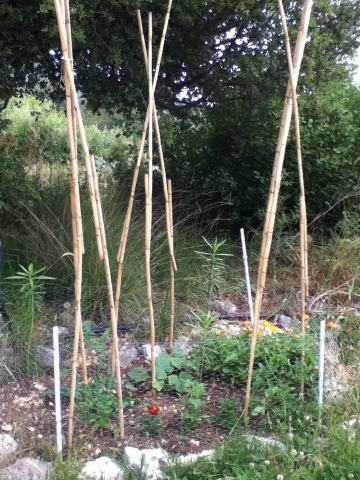 They go green when they’re cooked, sadly, but they look great in the garden. 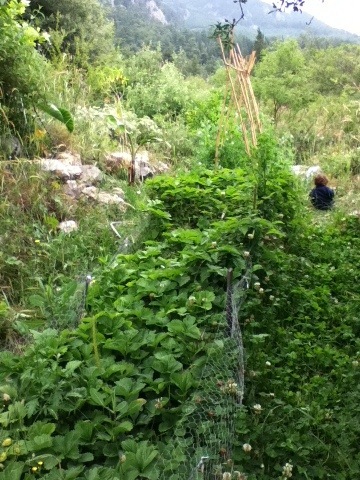 Today Kaya and I ate wild strawberries as we watered- we do munch in the garden, it’s true! Wonderful poem. Can’t wait to see the strawberry patch in full bloom. 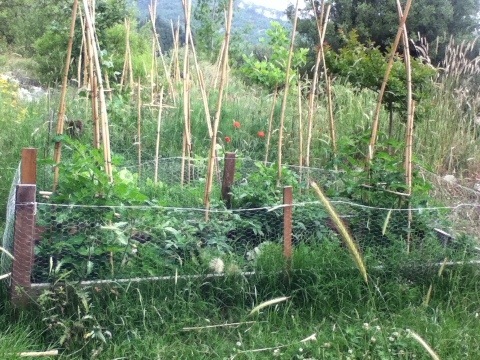 There are some flowers under all those leaves, and some strawberries too, though not many. They’re hiding from the birds under there I guess. Wow! 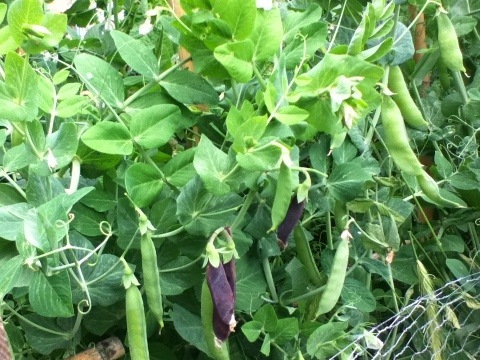 Purple snow peas? I have never seen those before and can’t wait to see what you will do with them. Artichokes are the craziest thing to see before they are harvested. Once, in France, I found myself in a field of them. So weird! I felt like I was in Jurassic Park or something. I have dug around the ponds and found only measly thin roots. I think I may have to put one plant in a larger space to get some good, large ones. Oh, but I would love to have some lotus root! 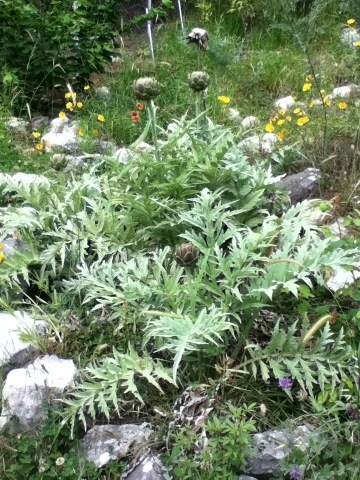 How I wish I could grow artichokes! I’d quit everything else just to be able to pick artichokes in my yard. Thank you for taking us on this tour. 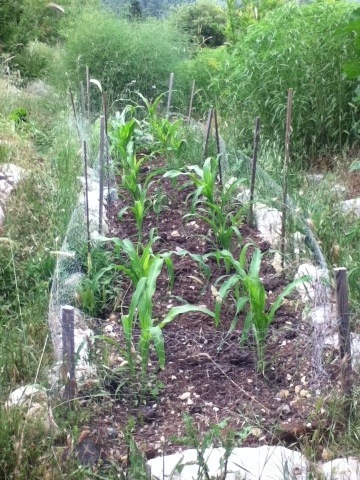 You’ve a lovely garden and it should yield plenty of vegetables for your growing family! I can’t tell you how much I’d like to share artichoke plants with you the next time I divide them! I hope you find yourself surrounded by artichokes one day. Thank you for taking us on a tour of your garden. 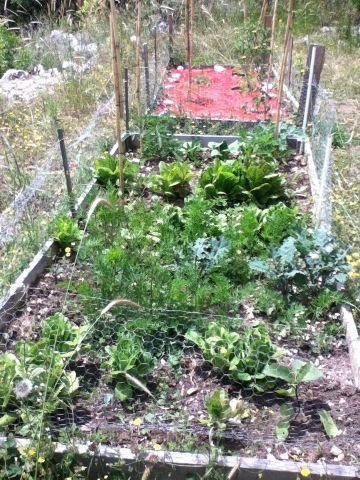 I wish I had more sunny space for gardening. Your gardens are wonderful. 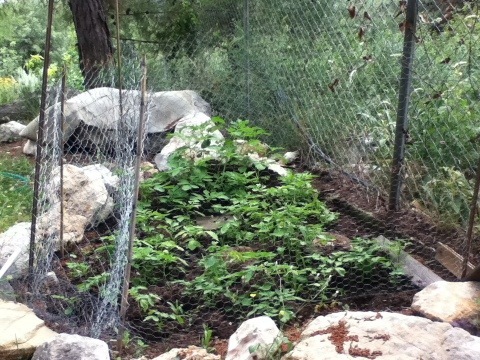 I just planted my tomatoes and you reminded me to plant my marigold seeds for the bugs. Oh, I love it when that happens — I like to think we are all looking over one another’s shoulders, and it’s nice when something useful comes of it.